Aster Pompon Blue Moon Callistephus Chinensis is an annual garden flower that can be easily started from aster seeds. Also known as China Asters, this variety produces stunning pompon-like, deep blue or violet aster flowers with an outer edge colored in delicate white. The flowers are fragrant, and they attract bees and butterflies from summer to fall. Aster Pompon Blue Moon is one of the most impressive annual flowers for cutting gardens, and this aster also looks fantastic in containers. Pompon Aster is often planted to create colorful borders and flower beds. Callistephus Chinensis likes full sun and rich, moist well-drained soil, but the plant adapts easily to the average growing conditions. 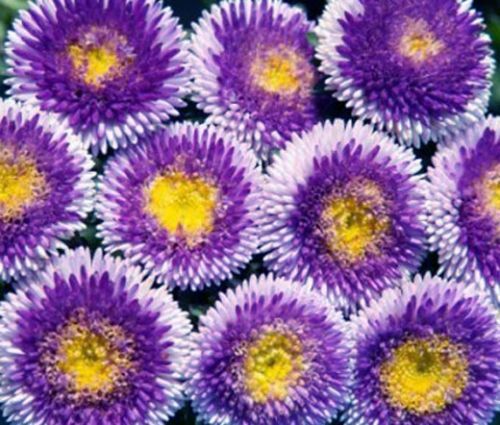 Aster Pompon is one of the best long-lasting cut flowers.